Visiting Iceland in winter can be a wonderful experience as there are fewer people, beautiful winter landscapes, and chances to see the Northern Lights! There are also a number of fun winter activities to do like skiing, dog sledding, snowmobiling, ice fishing, and joining in on holiday celebrations. Although some attractions in Iceland close or become inaccessible during the winter, many of Iceland’s most famous spots are still easy to visit, including the Golden Circle, waterfalls, Blue Lagoon, glaciers, black sand beaches, museums, ice caves, and the Jökulsárlón Glacier Lagoon. This post focuses on the best things to do in Iceland during the winter, and we cover everything from heli-skiing to holiday celebrations to Northern Lights tours! We provide information on how to do them independently (when possible) for those who want to rent a car and drive themselves. We also provide information on how to book winter day tours for those who want to base themselves in Reykjavík and take guided experiences. One of the first things you should decide when planning your winter trip to Iceland is how you want to get around the country. The two most popular ways to get around Iceland are by taking a bus tour or by renting a car, but you can also hire a private driver guide or take the public bus. Biking and hiking are not recommended as a way to get around Iceland during the winter months unless you are traveling short distances. The local public bus system can get you to all the main cities and towns in Iceland and although not the quickest, it is the best budget option. Buses may not stop at all the attractions you may want to visit so check the routes and schedules to decide if this is a good fit for you. Note that the Iceland hop-on hop-off buses, with the exception of the hop-on hop-off Reykjavík city sightseeing buses (run daily, year-round), do not run in the winter months. If you want to travel independently by car, you can rent a car from either of Iceland’s main airports or downtown Reykjavík. In the winter, we’d recommend something with 4-wheel drive and winter tires. We recommend comparing Iceland rental car prices online here to find the best deal. If you’d like to travel independently, but would rather have someone else make all the arrangements, you can also book a self-drive trip in Iceland where all the bookings are made for you (e.g., rental car, hotels), but you still travel independently and drive yourself. 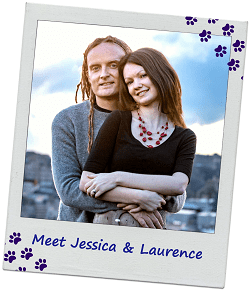 See our prior post with Iceland planning tips to help you decide what option might work best for you. If you plan to drive, check out our Iceland winter driving tips and advice. 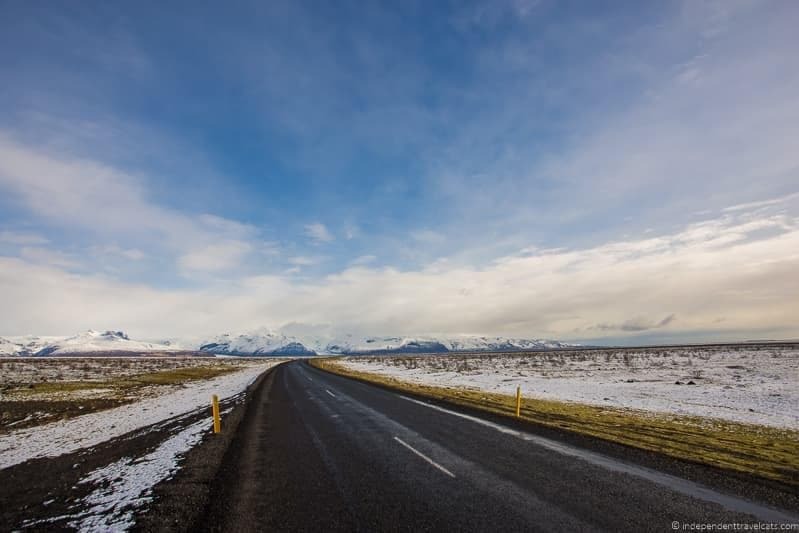 Be sure to check road and weather conditions before you set out each day, and I’d also take a look and bookmark the Iceland SafeTravel website. Here is our recommended 1 week Iceland road trip itinerary, which may be a handy reference for planning your winter trip. Many people base themselves in Reykjavík, and then set out in day trips to explore Iceland. This is particularly a good option in the winter months for those who don’t want to drive themselves and want to return to the same hotel or apartment each evening. Day trips can take you to all of the most popular highlights of Iceland, and we’d recommend focusing on western and southern Iceland. 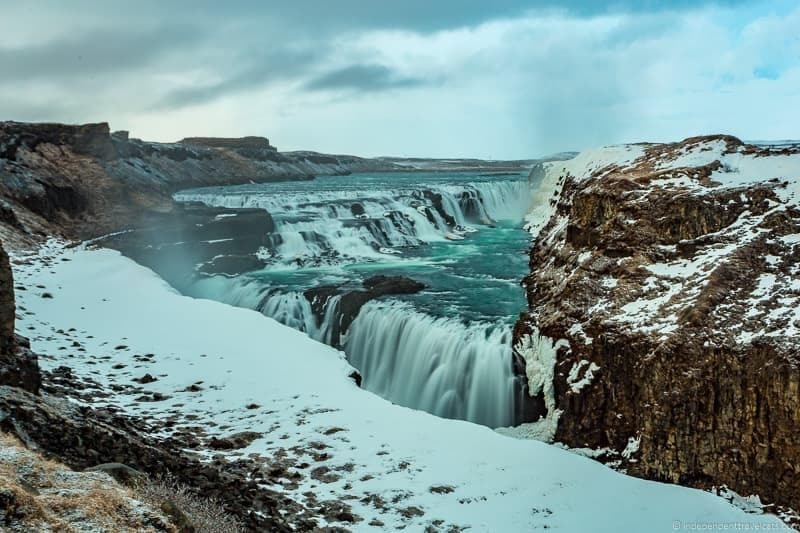 We have used and can recommend Iceland Travel for tours in Iceland as they are the leading Iceland tour operator and have been around since 1937. They offer hundreds of day trips, escorted tours, and self-drive itineraries, and provide good customer service in our experience. If you are planning to join a multi-day tour, there are a number of operators (most based in Reykjavík) to choose from that can provide longer tours from overnight trips to 2 week tours. 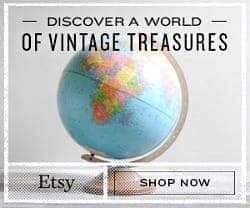 Itineraries often include, or include the option to add-on, many of the recommended winter activities covered in this post. Although this article is geared towards those who are either planning to take day trips or drive themselves, this post can help give you some ideas for the types of activity options and destinations you want to look for in a tour itinerary. When searching for multi-day tours, we’d recommend choosing an escorted tour that is particularly designed for winter such as this 5 day tour and this 7-day winter tour. You can see this curated list of some of the best guided tours of Iceland that range from 2 days to 12 days. It includes tours appropriate for all seasons, including many winter tours. Now onto our list of recommend top winter activities in Iceland! If you are visiting Iceland in winter, there are limitations as some activities are not available and certain attractions are inaccessible; however, there are also fun things to do in Iceland that you can only do during the winter months. 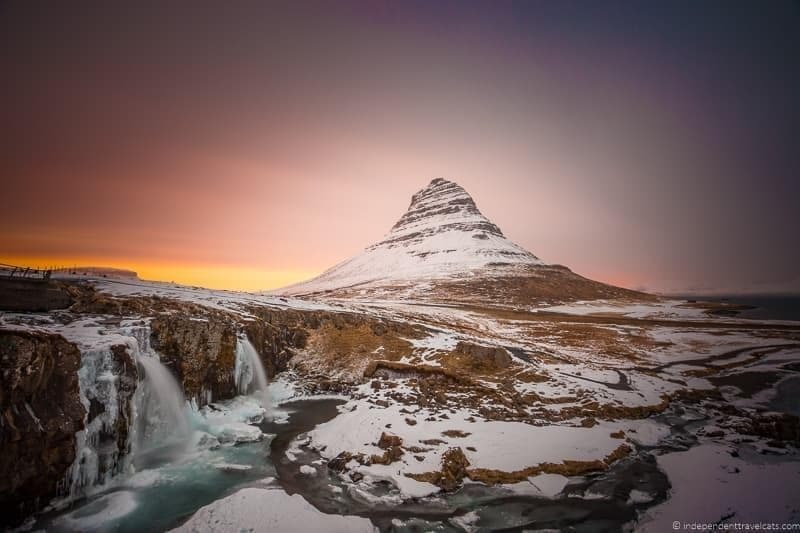 Our list focuses only on things that you can do in Iceland during the winter months. For each winter activity, we discuss information for both travelers who plan to travel independently by car and for those who want to travel via guided day trips with a base in Reykjavík. If you’re visiting Iceland in winter, then you are probably hoping to see the Northern Lights, or the aurora borealis, during your trip. This spectacular natural light show can fill the sky with varying hues of green and red, and can be a magical event to experience. The Northern Lights can be seen from autumn to spring, with the best chance being during the evenings of the winter months. In order to see the Northern Lights you need a combination of several things: high levels of solar activity, darkness (you can only see them at night), clear or partly clear skies, and an absence of light pollution. Some of these elements you can’t control (e.g., solar activity, cloud cover) so seeing them is partially down to nature and luck. But you can control where you are and if you have a car, you can head to sparsely populated areas where there is little light pollution, clear to mostly clear skies, and the weather forecast shows a chance of the aurora. Check the aurora forecasts for the best days and times to see them by using online websites, apps, or asking at your hotel (hotel desk staff often post the daily aurora forecasts and many hotels offer a wake-up service if there is activity). We used the Icelandic Meteorological Office Aurora Forecast to monitor activity during our trip as it is probably the best one to use in Iceland, and also got on the list at most of our hotels for the aurora wake-up service. It can be tricky to get good photos of the Northern Lights. But here is a guide about how to photograph the Northern Lights and includes tips for different types of cameras and smartphones. If you are only going to do one tour while in Iceland in winter, we’d recommend booking a Northern Lights tour. We’d also recommending doing this as a tour rather than trying to hunt for them yourself. Tour operators know where to go to find the darkest spots, know how to interpret the meteorological data, know where they can park, and usually only operate if there’s a chance of seeing them. Tours are cancelled same day if there is no chance of seeing the Northern Lights, and most companies offer a free rescheduling for the following day if the trip is cancelled or if you go but don’t see the Northern Lights. Be sure to check the tour conditions so you understand what happens if your tour is cancelled or you don’t see the Northern Lights. 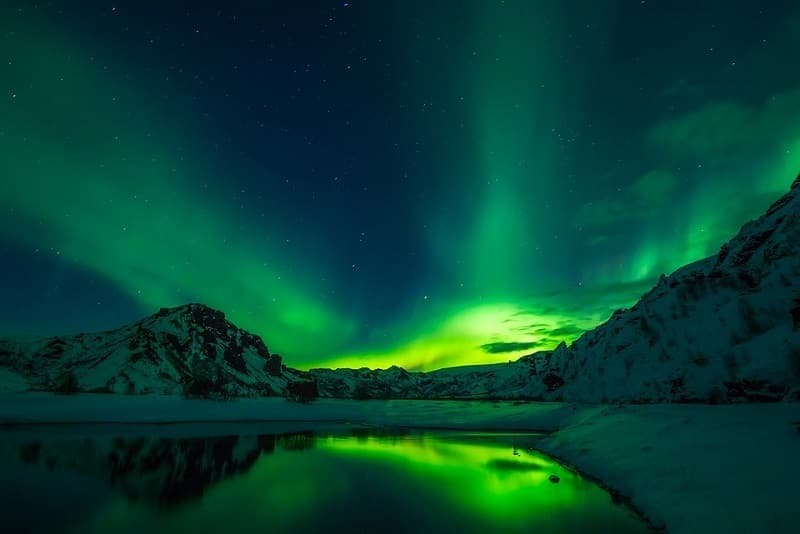 Northern Lights tours are very popular throughout the winter months, and there are a number of variations offered by Iceland Travel depending on your preferences, including a group tour, a private tour and even a boat tour. Some Northern Lights tours also include additional experiences like meals, thermal baths, glacier walks, or Super Jeep tours. All tours include transportation, driver, and guide, and the majority depart from Reykjavík. If you enjoy skiing and are looking for a lesser known European destination, Iceland is a good bet. It is not nearly as well-known or popular as many spots in Europe so the resorts aren’t hugely crowded, and there are almost no trees to accidentally hit! The resorts are much smaller here, but opportunities include downhill skiing, snowboarding, cross-country skiing, and off-trail skiing. There are also unique opportunities like skiing down to the Ocean, Cat skiing (reaching tops of mountain by snowcat) and even heli-skiing in a couple of locations in Iceland. Most ski resorts have runs that cater to both newbies and more experienced skiers. Although the ski season in Iceland can extend from mid-November to May, most resorts open in December and close by the end of April. However, for the best skiing (and chance of good snow) I’d go in February or March, especially if you are a downhill skier or snowboarder. Because of limited winter hours, almost all ski resorts have lights on their main slopes which allow for night skiing. If planning to ski or snowboard, check out our ski holiday packing list for a list of things you probably want to pack. You can actually design an entire itinerary around skiing in Iceland as you’ll find ski opportunities in the north, west, south, and east of Iceland! When choosing where to ski, I’d base it on where you plan to travel in Iceland, past ski experience, and the current snow and trail conditions. Just note that driving in the northern and eastern parts of Iceland in winter can be more difficult than in the south and west. In western Iceland, there are two Reykjavík area ski slopes. There is Bláfjöll ski resort, which is the largest and most visited ski resort in Iceland, and Skálafell ski resort. Then in the Westfjords you have Dalirnir near Ísafjörður. In the east, you have a couple of options Stafdalur and Oddsskarð. Then in the far northwest you have Tindastóll near Sauðárkrókur. For those who are visiting Iceland primarily for skiing or snowboarding, I’d recommend basing yourself in northeastern Iceland. Akureyri or nearby would be a good base for the several ski resorts in the area. These include Hlíðarfjall which is considered Iceland’s premier ski destination and also sits at the highest elevation. It offers pistes that range from beginner level to difficult, cross-country trails, a ski rental shop, and a ski school. 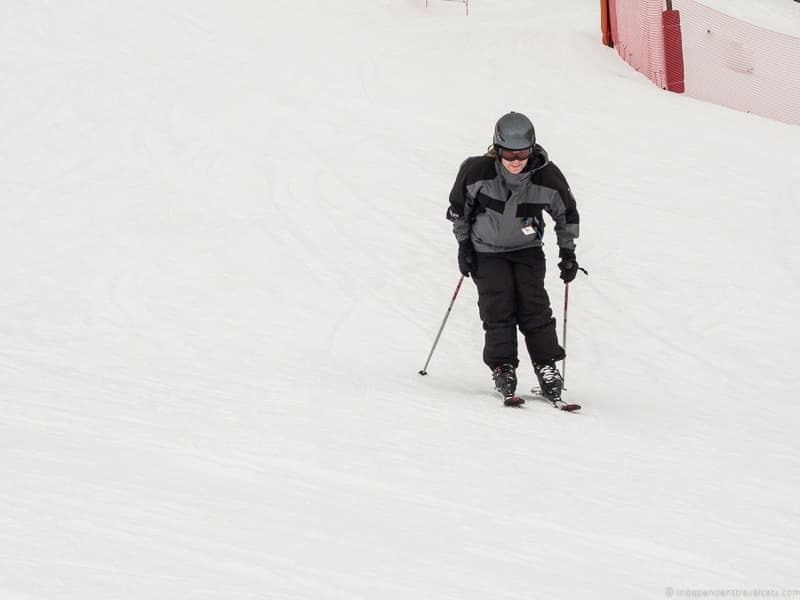 If you’re planning to spend more than a couple of days skiing in Iceland, I’d invest in the local Ski Pass which allows you to ski at 5 ski resorts in northern Iceland over 5 days so you can try out all the local slopes and save money on day fees. Heli-skiing is where you are taken to the top of a mountain by a helicopter and then you can ski down. If that sounds like fun you can book a heli-skiing trip on the Tröllaskagi Peninsula (part of the northeast) with Arctic Heli Skiing or Viking Heli Skiing. In some cases you can ski all the way to the ocean. Note that heli-skiing season usually starts later and runs later than regular skiing at the resorts, often February to June. If heli-skiing is a bit too scary or pricey for your tastes, you can also do cat skiing in northern Iceland with companies such Kaldbaksferðir, where you are taken to the top of the mountain by a snowcat to ski, sled, or snowboard down. You can find a few ski tours in Iceland, including day tours and a multi-day tour, on offer from local operators. However, there are few ski or snowboard oriented tours available in Iceland so the best option for most people is going to be to arrange their own trip. We’d recommend booking a taxi or other private transport to and from the ski resorts of your choice. The closest to Reykjavík, which can easily be done as a day trip, is the Bláfjöll ski resort 25 minutes drive from Reykjavík. Bláfjöll is the largest and probably the most popular ski resort in Iceland. It offers family friendly slopes, gear rental, and ski lessons (on weekends). There is also Skálafell ski resort, which is also about a 25 minute drive from Reykjavík, but it is a much smaller resort than Bláfjöll. You can also fly or take the public bus to Akureyri and hit about a half dozen ski resorts within day tripping distance. In deciding on a ski resort, I would base your decision on your location, amount of time, your skill level, and how much you want to ski. If you are short on time or want the most convenient option, I’d visit the ski resorts within driving distance of Reykjavík. If you want to ski a lot, I’d head to Akureyri where there is the highest concentration of skiing opportunities. For the most variety in ski slopes, I’d head to Hlíðarfjall in northern Iceland or Bláfjöll if you are day tripping from Reykjavík. At most resorts in Iceland you should be able to rent any skiing or snowboarding gear you need (although always best to bring your own ski boots if you own them) but do check ahead. Visiting Iceland in winter means you might be around for one of the holiday celebrations that take place at this time of year. Christmas celebrations in Iceland start on December 12th and intensify until December 23rd, Þorláksmessa (St. Þorlákur’s Day), when it is traditional to eat fermented skate (skata) and potatoes and is a big shopping day for many Icelanders. Around the Christmas season, you can enjoy the holidays lights and decorations, Christmas markets, Christmas carols and concerts, and learning about Icelandic Christmas traditions. Christmas itself is celebrated on December 24th, and it’s traditionally a family affair spent at home. 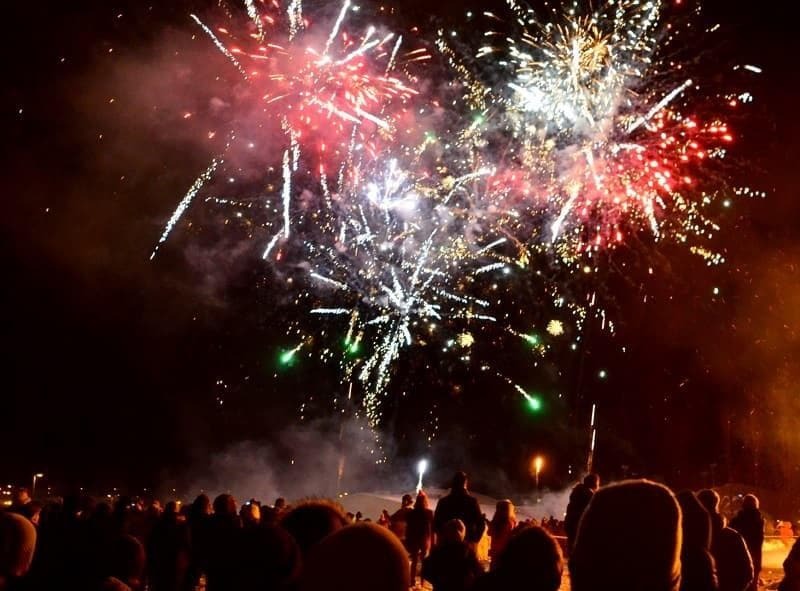 For more of a party atmosphere, you’ll want to be in Iceland for New Years Eve, when it’s traditional to attend a bonfire and set off fireworks. The “end” of Christmas on January 6th (Twelfth Night) is also usually marked with fireworks and bonfires. The best place to be for the holidays is probably Reykjavík as there you’ll find the most people, most events, and largest public celebrations. 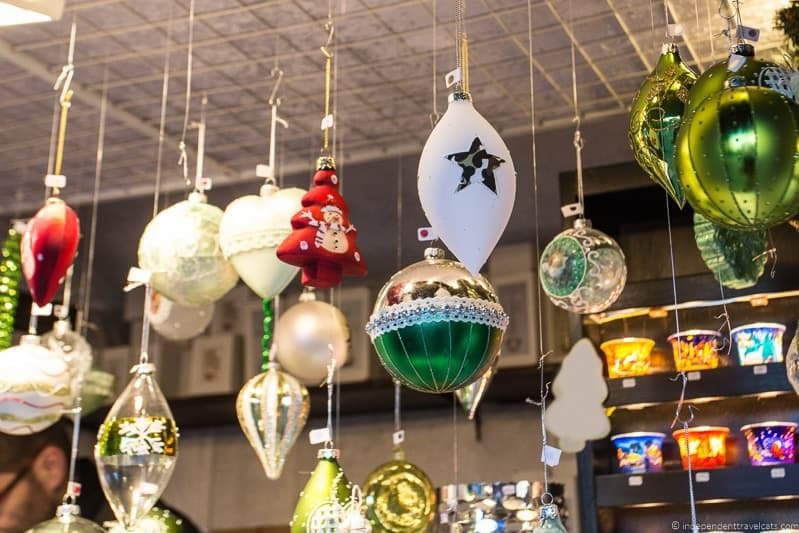 If you are wanting to do some Christmas shopping, you’ll also find the largest number of stores here, and some stores and restaurants stay open on holidays (although many do close). I’d check out local websites or newspapers, or talk to your hotel staff or locals to find out what holiday events will be happening during your visit. Another idea if you want to get out of Reykjavík is to head to northern Iceland and visit the Lake Mývatn area. This is the home of the 13 Yule Lads which are a huge part of the Icelandic Christmas story. 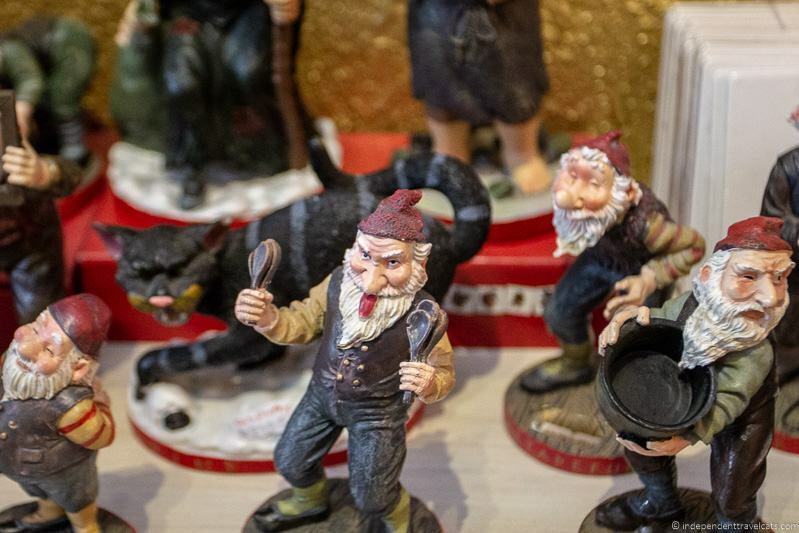 The celebrations begin on December 12th and there are a series of family-friendly events in the area leading up to Christmas which include music concerts, buffet holiday meals, family craft workshops, handicraft markets, and an annual bath with the Yule Lads! Akureyri is a good place to base in the north during the holidays. If you are visiting around Christmas, I’d check for Christmas related tours that are being offered. 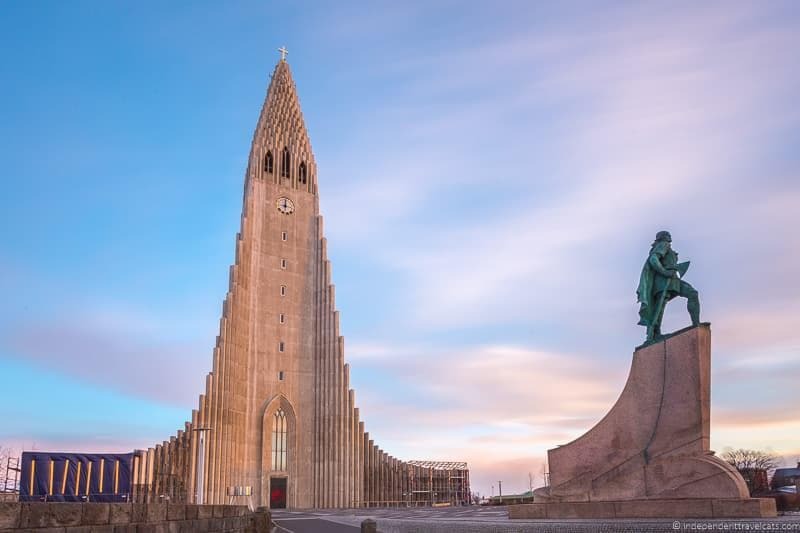 For example this 3 night Christmas tour includes 3 nights lodging in Reykjavík, a Golden Circle day tour, Christmas meal, and a Christmas themed walk. If you are looking to visit both Reykjavík and northern Iceland, I’d check out tours to Akureyri as well. On New Years Eve you can take a Fireworks Cruise to see the fireworks from the water and celebrate the New Year, or you can take a bonfire tour to experience a number of the traditional local bonfires around the city. the figure in front is the Spoon-Licker Yule Lad! 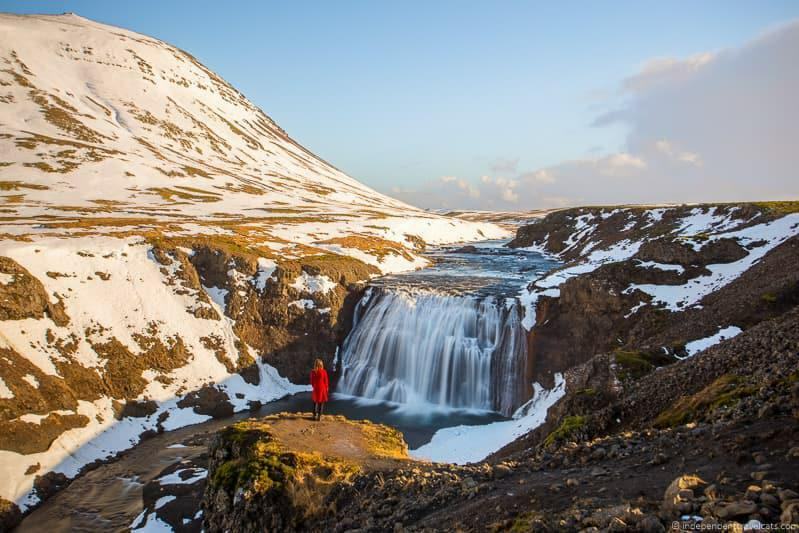 One of the most popular year-round day trips from Reykjavík is to explore the “Golden Circle”, which includes a number of Iceland’s most popular landmarks. These include the mighty 2-tiered Gullfoss waterfall, the bubbling pools and geysers of the Geysir geothermal area, and Thingvellir (Þingvellir) National Park. Thingvellir National Park is a UNESCO world heritage site and contains some of the most important historic, geological, and religious spots in Iceland. It also contains Games of Thrones filming locations! Driving the Golden Circle makes for a great day out from Reykjavík as you can see some of Iceland’s spectacular natural geological features plus learn a bit about Iceland’s cultural history. If you are driving from Reykjavík, it is about a 40 minute drive to Thingvellir National Park, then 53 minutes further to Geysir, and then 10 minutes further to Gullfoss waterfall. The route is well-marked and signed. Without stops it takes about 3.5 hours to drive the route round-trip with return back to Reykjavík; however, with stops I’d suggest at least 6 to 7 hours. In additional to those 3 main stops, you can also consider going snorkeling or diving at Þingvellir National Park (only if you have certified diving experience), stopping in at the greenhouses at Friðheimar where you can see a geothermal greenhouse and have lunch with food grown there, tasting the locally made ice cream at the Efstidalur farm restaurant, or going for a soak at a geothermal bath such as Fontana Geothermal Baths or the Secret Lagoon. All Iceland tour companies offer Golden Circle day trips from Reykjavík as this is the most popular day trip from the city. If you are looking for a nice day out with stops at all three of the main sites along the Golden Circle, we recommend checking out the Golden Circle Classic tour, which is available as both a group tour and a private tour. If you’re in a rush, then there’s also the Golden Circle Express tour. Finally, you can combine a number of awesome experiences into one all day tour, and do a Golden Circle and Northern Lights tour. This tour includes the three main Golden Circle attractions, many of our recommended optional stops (greenhouse, farm, geothermal bath), as well as a chance to see the Northern Lights! Winter is the perfect time to explore an ice cave, a glacier, or an ice tunnel in Iceland. 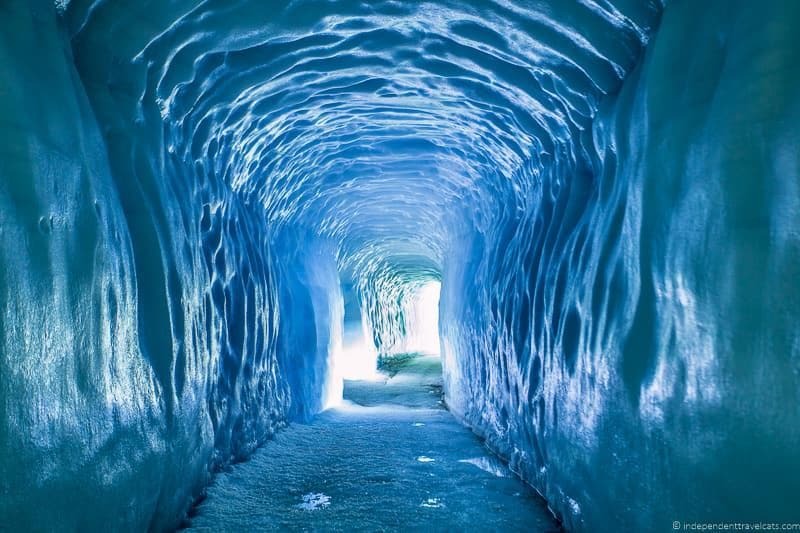 Tours allow you to actually get inside beautiful ice caves and tunnels so you can see their beautiful blue colors and learn about the formation of glaciers. You can also take tours that allow you to hike or snowmobile on top of glaciers. Iceland has a lot of glaciers and they cover about 11% of Iceland’s surface. Note that in Icelandic, jökull means glacier or piece of ice. So if you see a word ending in jökull, it is probably the name of a glacier. Trying to explore an ice cave or tunnel, hike onto a glacier, or drive onto a glacier on your own can be incredibly dangerous if you don’t have the necessary knowledge and equipment. This can be particularly dangerous in the winter when snow can disguise cracks and crevasses in the ice. We highly recommend only doing these things with a trained guide and proper equipment. There are many private guides and group tours available that can help you safely examine these spots. If you are not wanting to join a bus tour from Reykjavík, you can drive to the location on your own and join a local tour or guide near the ice cave or glacier. This a great option for those who want to join activities during a road trip around Iceland. Some ice cave tours offered in the winter include an ice crystal cave tour which can be joined in Reykjavík or Vík (western Iceland), an exploration of ice caves around Vatnajökull glacier in Fagurholsmyri (southern Iceland), and the Into the Glacier tour from Husafell (western Iceland). For glacier exploration we’d recommend checking out the Myrdalsjökull glacier snowmobile tour from the glacier basecamp (southern Iceland), a Solheimajökull glacier walk from the glacier’s basecamp (southern Iceland), or a hike and ice climbing at Solheimajökull glacier. All the following tours depart from Reykjavík. If you’d rather depart from another location, see tours listed in the section above. Note that these tours range from low physical activity to needing to be fairly physical strenuous so be sure to read the guidelines and recommendations to find a tour that is a good fit for you. There are a number of ice caves in Iceland, and from Reykjavík, we’d recommend this day tour of the Ice Caves of Myrdalsjökull Glacier. 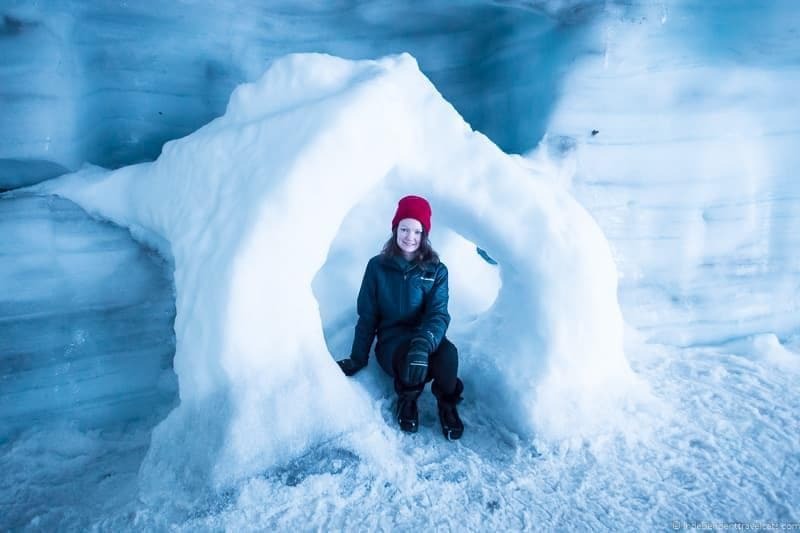 If you are able to do an overnight trip, we recommend this small group tour which includes an ice cave tour, exploration of the South Shore, a visit to the glacier lagoon, and a Northern Lights hunt. The Langjökull ice tunnel was made by a group of scientists and engineers on top of Langjökull glacier, the second largest ice cap in Europe. 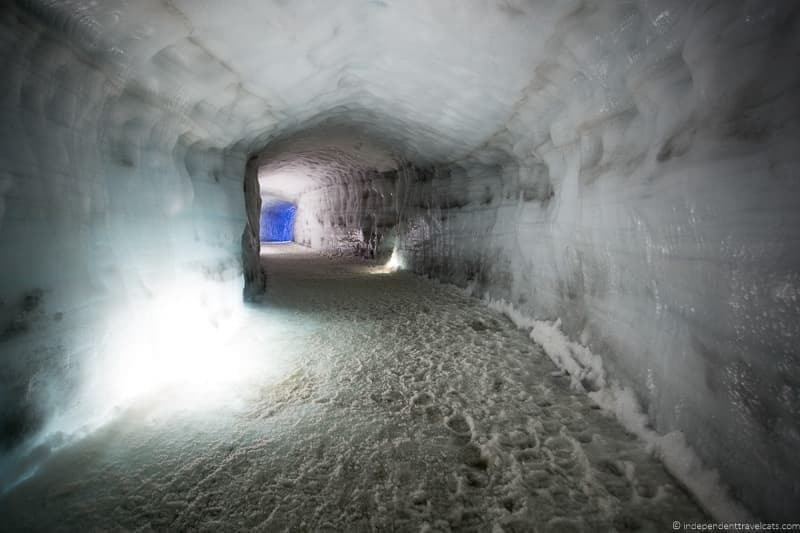 The 1,800 ft. long ice tunnel and caves are the world’s first and largest man-made ice tunnel, and allows visitors to see the inside of a glacier. Tours we’d recommend checking out are this ice tunnel tour which also includes snowmobiling on a glacier and a stop at a thermal swimming pool, and this tour of the ice tunnel which includes a trip onto the glacier via a ride in a 8-wheel monster truck. 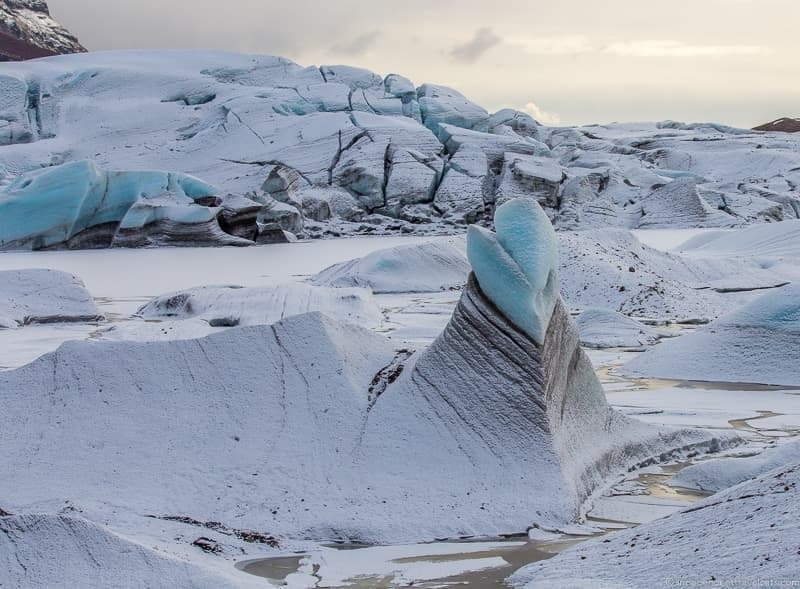 If you are wanting to walk, snowmobile, or take a super jeep tour on top of a glacier, you’ll find there are a lot of options for glacier day trips from Reykjavík. These include an easy glacier walk on Eyjafjallajökull glacier, a glacier walk plus Northern Lights tour, a Golden Circle drive plus snowmobiling on a glacier, a Golden Circle tour plus a glacier drive in a super jeep, and a hike and ice climbing tour at Solheimajökull glacier. Another popular drive in Iceland, and for good reason, is the trip along the south coast between Reykjavík and the Glacier Lagoon. This southeastern area of Iceland is home to multiple spectacular waterfalls, a huge expanse of lava field, black sand beaches, glaciers, and a lagoon filled with tiny icebergs. The main attractions in this area are accessible year-round, although may become temporarily inaccessible (e.g., due to a blocked, flooded, or closed road) during or following a storm. It is about 230 miles (372 km) from Reykjavík to the Jökulsárlón glacier lagoon, and it takes about 4.5 hours to drive without stops. Once you get out of Reykjavík, you’ll mostly just follow Route 1, which is the National Road of Iceland, and forms the famous Ring Road. 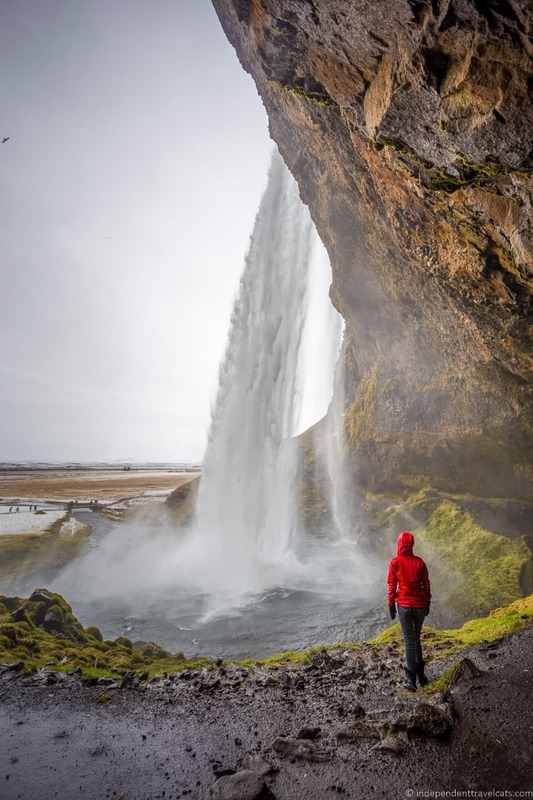 Highlights along this route include views of the glacier topped volcano Eyjafjallajökull (well-known for its 2010 eruption), Seljalandsfoss waterfall, Skógafoss waterfall, Reynishverfi’s black sand beach, the village of Vík, and Vatnajökull National Park. For a return day trip with stops at all the listed highlights and meals, I would plan on at least 11 or 12 hours. Be sure to check weather forecast and road alerts before setting out. Driving all the way to the Jökulsárlón glacier lagoon is a long drive from Reykjavík, and if you factor in all the stops, it is a long day out. If possible, we’d recommend overnighting here and heading back in the morning so you have more time to explore and don’t have to worry about driving late at night. The eastern part of Iceland also has low levels of light pollution so chances of seeing the Northern Lights are good if there is activity and clear skies. If you do stay overnight in this area, we’d recommend staying in Kirkjubæjarklaustur or Vík. Around Kirkjubæjarklaustur, you may want to check out Hotel Klaustur, Hotel Geirland, Hotel Laki, and the Eldhraun Guest House. Around Vík, you can check out Hotel Vik, Hotel Katla Hofdabrekka, Grand Guesthouse Gardakot, Guesthouse Steig, and the Volcano Hotel. If driving for over 9 hours round trip in potentially bad winter weather doesn’t sound fun, you can take an escorted tour instead and leave the driving up to someone else. 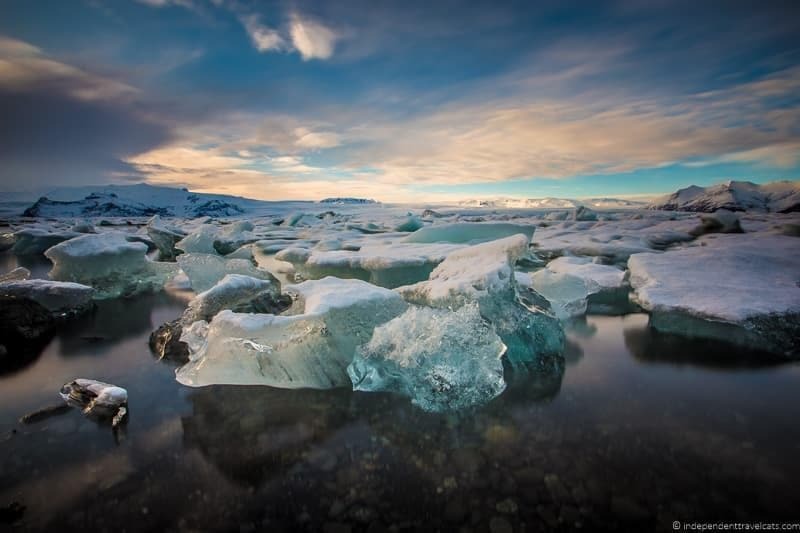 We recommend doing this as an overnight tour so you can spend more time exploring, but if you only have the time for a day trip and need to return to Reykjavík the same day, we’d recommend this Glacier Lagoon and South Shore tour. If you are able to do an overnight tour to the South Shore and Jökulsárlón glacier lagoon, we recommend this small group tour which includes an ice cave tour, exploration of the South Shore, a visit to the glacier lagoon, and a Northern Lights hunt. One of the reasons many people travel to Iceland is to see some of its local wildlife, and this includes whales. Iceland is one of the best whale watching destinations in Europe with over 20 whale species found in its waters. A whale watching tour can get you up close to these massive sea mammals, as well as a variety of other sea wildlife. The main sea animals you are likely to see on a boat tour are the humpback whale, minke whale, fin whale, orca, white-beaked dolphin, and the harbor porpoise. Note that the best time to see whales in Iceland is during the summer months, but you still have a chance to see some species year-round. 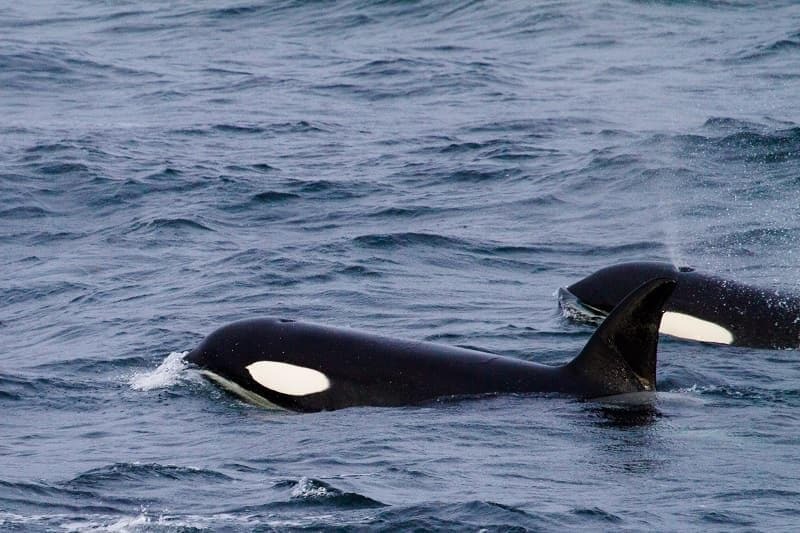 In fact, winter is the best time to see certain whales such as the Grundarfjördur orcas (killer whales). If you are interested in the whales around Iceland, you might want to visit the Whales of Iceland exhibition in Reykjavík. It is located near the harbor where most of the whale watching tours leave. The museum provides an immersive learning experience and includes over 20 life-sized models of whales that have been found in Icelandic waters. You could get lucky to spot a whale from shore, but your best chance to see one is to join a whale watching tour. The two main departure points in Iceland for whale watching tours are Reykjavík and Húsavík in northern Iceland. Chances of seeing whales are high from both areas, and Húsavík has been nicknamed the whale watching capital of Europe. In the winter we’d recommend joining a tour in Reykjavík for convenience and the fact that many tour operators don’t operate during the winter in Húsavík. In Reykjavík, most whale watching tours depart from the Old Harbor, and you can either book a tour in advance or head to Reykjavík’s Old Harbor and book one directly with one of the tour company kiosks at the harbor. Tours generally last between 2 to 4 hours. This whale watching tour reports a 90% success in seeing whales and if you don’t see them on your tour, you get a second one for free. You can add on lunch or dinner as well to many whale watching tours. Another company that offers well-reviewed whale watching tours are is Elding which also operates the Whale Watching Centre. Iceland Travel also offers whale watching tours from Grundarfjordur on the Snæfellsnes Peninsula (highly recommend this one if you want to see orcas as there is a large pod that feeds here each winter). NOTE: If you are also interested in seeing seabirds, winter is not a great time to travel to Iceland as there are few sea birds around. Spring and Summer are the best times of years to view sea birds. whale sightings are hard to catch a photo of! Snorkeling in winter? No, we’re not completely mad. You can snorkel year round in Iceland, but you’re not going to be heading out to sea or spotting a lot of marine life. Instead, the snorkeling trip takes place in the Silfra fissure in Thingvellir National Park. This is the site of a submerged crack between the two continental plates that run across Iceland, and the water here is incredibly clear with great visibility. 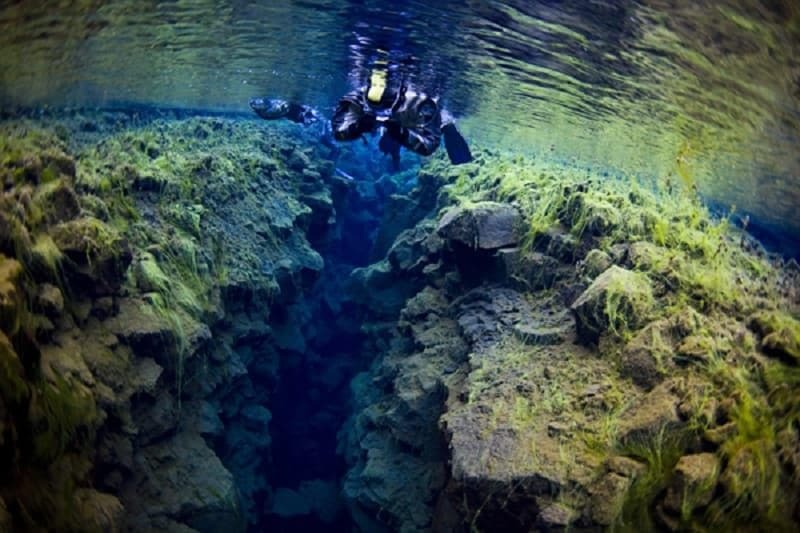 Being able to snorkel between the Eurasia and North American continental plates is a snorkeling experience like no other! The national park does not have any official guides or operators for snorkeling tours or equipment rentals, but there are several companies offering snorkeling tours and gear for those wanting to snorkel at Silfra. There are a number of tours for snorkeling that meet on site at the park like this one. 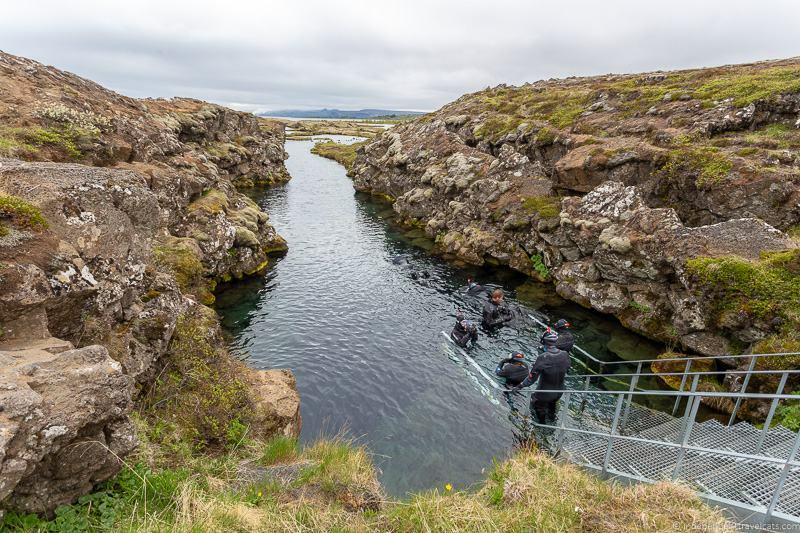 As noted earlier you can also dive at two submerged rifts, Silfra and Davíðsgjá, but this is only for experienced divers and you’ll need dry suit certification as well as apply for a dive permit. Find out more about diving in the Thingvellir National Park here. Unless you have dived here before, you’ll probably want to have a guide, and we’d recommend checking out this dive company based in Iceland. There are other spots you can dive in Iceland other than Silfra and a local guide can help you explore lesser known sites. For a local dive rental shop you can also check out HAF Sport. There are a number of Silfra snorkeling tours that depart from Reykjavík. The tour we suggest with Iceland Travel is the snorkeling plus cave tour which includes both snorkeling at Silfra plus the opportunity to explore a lava cave with pickup and drop off in Reykjavík. The tour price also includes all the gear you’ll need, including a full dry suit that will keep you warm and dry even in freezing temperatures. Northern Iceland gets far fewer visitors in winter than the rest of Iceland. But that doesn’t mean there’s nothing to do here! Located near the town of Akureyri, volcanic Lake Mývatn is home to a number of natural wonders such as craters, mud pools, massive waterfalls, and geothermal caves. It is also a popular birding area, although most species are only here in the Spring and Summer months. Akureyri is also a great place to celebrate Christmas. Making the effort to come up to northern Iceland is definitely rewarding, but bear in mind that winter weather can make for a challenging driving experience. Public buses or domestic flights are also options. Highlights around Lake Mývatn include the Goðafoss Waterfall, Hverfjall crater, the pseudocraters of Skutustadagigar, lava pillars of Dimmuborgir, the Krafla volcano, and hot springs. You’ll definitely want to overnight in the area as there is plenty to explore and you’ll find a number of lodging options in Akureyri. For a day trip from Reykjavík to Lake Mývatn, we’d recommend taking a look at this tour, which includes domestic flights and stops at Goðafoss Waterfall, the pseudocraters of Skutustadagigar, the lava pillars of Dimmuborgir, Reykjahlid village, the Krafla volcano, and Mývatn Nature baths. If you are searching for Game of Thrones locations in Iceland, this GoT themed Mývatn tour can be begun in either Akureyri or Reykjavík and includes most of the popular filming locations. If you are already in northern Iceland or want to just book your flight yourself, this small group tour, which departs from Akureyri, includes a number of Lake Mývatn highlights plus a soak in the Mývatn Nature baths. Icelandic horses are beautiful creatures, with long shaggy coats that help them withstand the tough Icelandic wintry conditions. They are very photogenic (they even made our Iceland photography guide) and are unique in that they are one of a few horse breeds where a number of the horses have five distinct gaits. You are likely to see an Icelandic horse during your trip without much effort as there are many farms with horses around the country, and you can even find a few at the Family Park & Zoo in Reykjavík. But if you want to get really up close, you can interact and ride Icelandic horses by visiting a farm and booking a horseback riding tour. 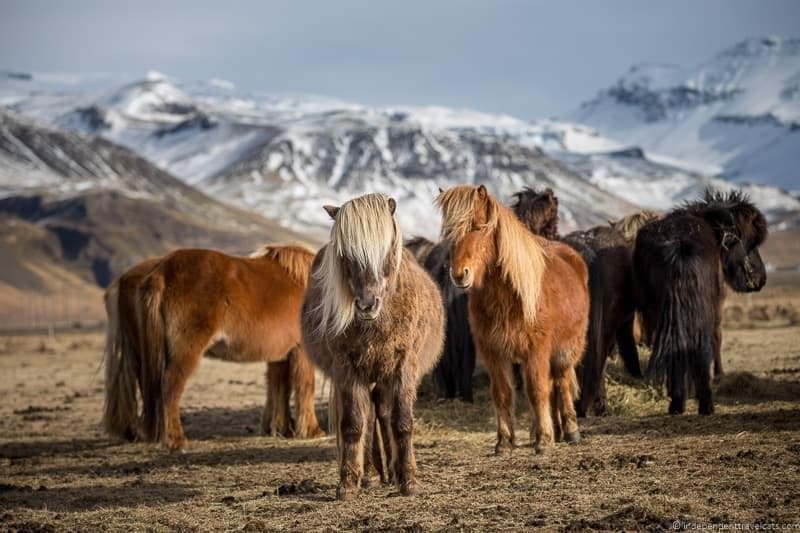 There are over a dozen horse farms and riding facilities offering guided horse rides in Iceland, and I’d search in the area of the country you plan to visit. The highest concentration of farms offering riding is within an hour or two driving distance of Reykjavík, but you’ll find them scattered all over the country. At most places, you need to book your riding activity in advance. Some places to consider include Laxnes Horse Farm near Mosfellsbær (just 15 minute drive north of Reykjavík), Íshestar Riding Centre in Hafnarfjörður (about 30 minutes south of Reykjavík), and Langhus Farm in northern Iceland. 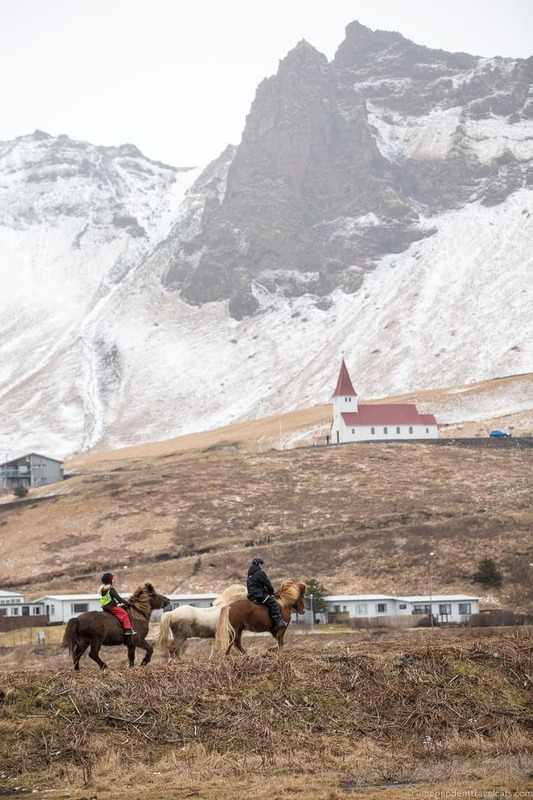 This hour riding long tour departs from near Flúðir (southwestern Iceland), and would be a good tour to add to a self-drive Golden Circle road trip. 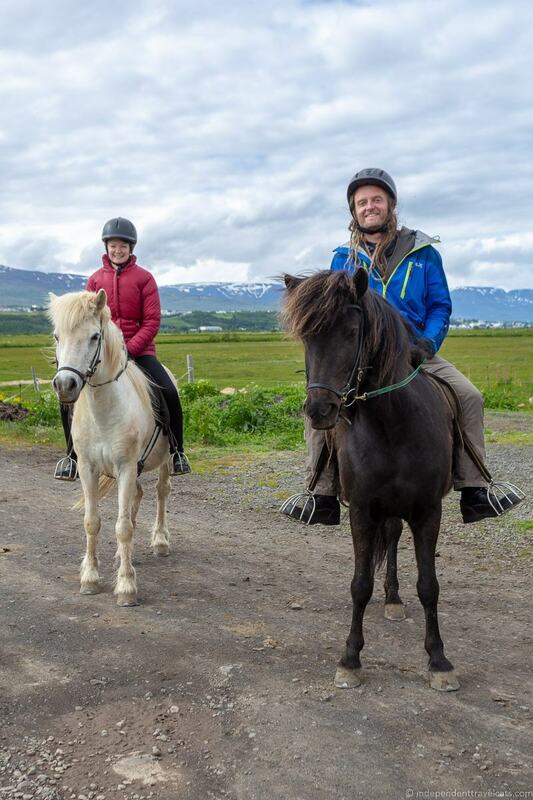 You can also join guided tours or rent horses to ride (for more experienced riders) at Sólhestar (services around Reykjavík and south Iceland). Horses aren’t the only big mammals in Iceland, and if you looking for something a bit more wild consider reindeer trekking. If you’re interested in reindeer, then head to eastern Iceland, where you can join an experienced guide on a Reindeer Safari to track down these beautiful animals. There are also a number of tours you can take that focus on Icelandic horseback riding. From Reykjavík you can take a Horseback Riding Lava Tour, which visits the lava fields around either Mt Helgafell or Lake Hvaleyrarvatn. This tour is suitable for riders of any experience level. Some of the tours available at Laxnes Horse Farm include pick up and drop off in Reykjavík. More experienced riders looking for a longer tour might prefer the Horseback Riding Viking Tour, which also departs from Reykjavík. This is a longer experience with both a morning and afternoon ride, and is for intermediate to experienced riders only. Reykjavík is Iceland’s capital city and also the cultural heart of Iceland. Here you’ll find many of the country’s best museums, parks, art, and cultural attractions, and most are open to visitors year-round. But you can also find some interesting cultural spots in other parts of the country, often ones that document a local history, industry, tradition, or saga. 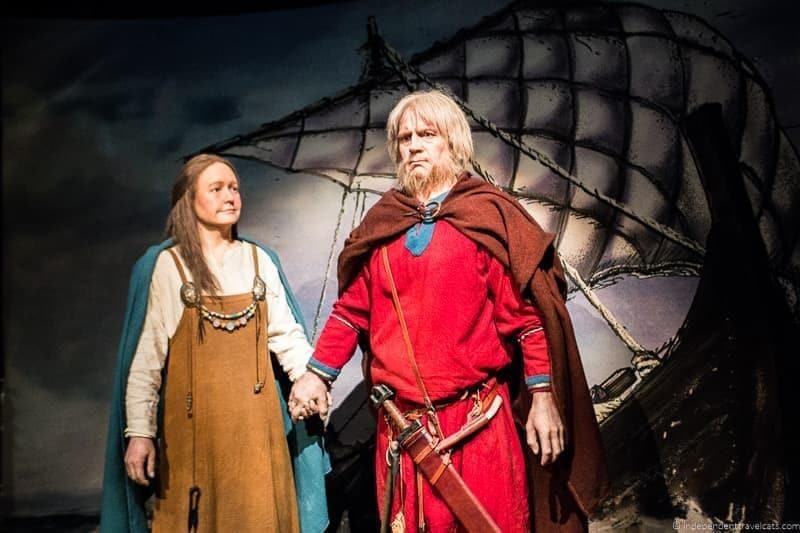 Some of the biggest themes we noted after visiting a number of the country’s museums are art, local history, Icelandic sagas, maritime and fishing culture, and preserved buildings. Spending a few hours visiting some of the country’s museums is a great way to spend a winter afternoon, especially if the weather is not at its best. Reykjavík is easy to explore by foot, car, or public transportation, and many of the city’s top attractions are within walking distance of each other. Some of the museums and cultural attractions you may want to visit in the capital are the National Museum of Iceland, Hallgrímskirkja Church, The Settlement Exhibition, Reykjavík Family Park, Perlan Museum, Saga Museum, Árbaer Open Air Museum, and a number of art museums. Just about all attractions are open year-round in Reykjavík; however, many have reduced winter hours and are likely to be closed on holidays. Outside of Reykjavík, a car makes it easy to reach all the country’s major museums and cultural attractions. It is easy to mix natural sites with cultural sites on an Iceland road trip itinerary. The most notable historical attraction is probably Thingvellir (Þingvellir) National Park which is a site of historical, geological, and religious importance because it was the place of the first church, the site of the first parliament in Europe (the Alþingi general assembly), and has a number of notable geological features. I’d also recommend the folk museum Skógasafn in the town of Skógar, which is open-air museum complex plus two museums along the South Coast with over 15,000 artifacts and 6 historical buildings. Other museums and cultural attractions (many related to the country’s fishing culture and history) include: the Whale Museum, Lava Centre, Bjarnarhöfn Shark Museum, the Norwegian House, the Icelandic Settlement Centre, Borgarnes Museum, and the Herring Era Museum. Note that most of these have reduced winter hours and some may open by appointment only in the winter months, so do check the attractions’ website or call ahead. Since most of the country’s top museums and cultural attractions (see list above to get you started) are located in and around Reykjavík, we recommend that you are better off exploring on your own on foot or via public transportation. 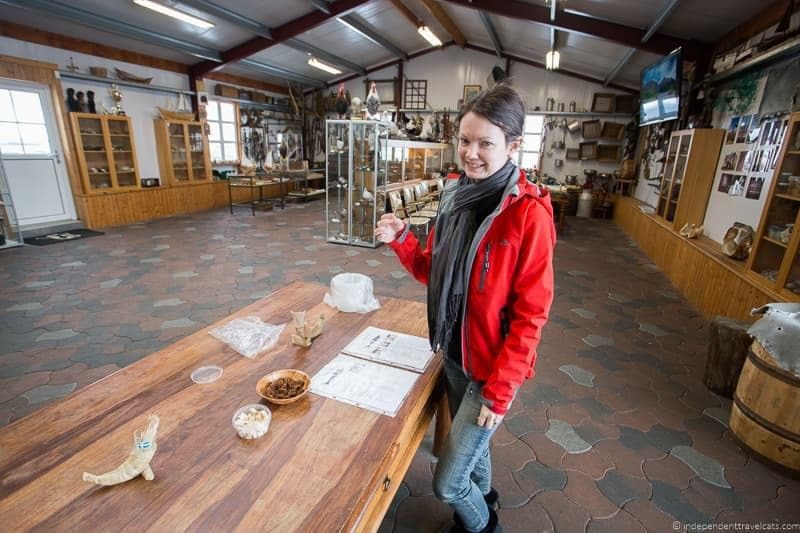 For museums outside of Reykjavík, I’d book a private tour or join a group tour that goes to the specific museum(s) you are interested in visiting. 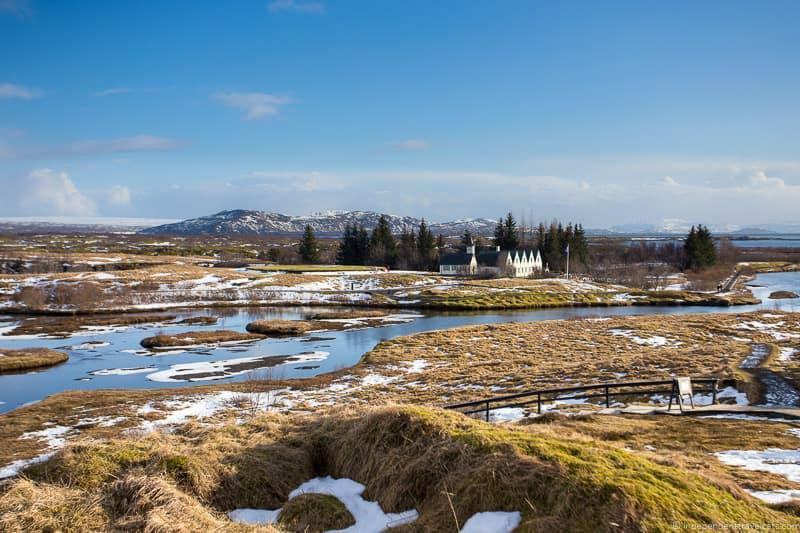 If Thingvellir National Park is on your list, this one is easy as almost all Golden Circle day tours stop here. The Snæfellsnes Peninsula is a region in western Iceland known for its dramatic landscapes, and is accessible year-round. A couple of hours drive north of Reykjavík, this beautiful part of the country is home to a huge glacier as well as waterfalls, beaches, fishing villages, caves, and a glacier. It makes for a very interesting day trip from Reykjavík at any time of the year. The most known attraction on the peninsula is the glacier-topped mountain Snæfellsjökull as it was featured in Jules Verne’s Journey to the Center of the Earth as an entry point to get to the center of the earth. The Snæfellsnes Peninsula makes for a great day trip, and it takes about 2 hours to get from Reykjavík to the eastern side of the peninsula. After leaving Reykjavík, you’ll need to decide to take the undersea tunnel at Hvalfjordur (small fee, can save about 30 minutes) or you can follow along 47, a coastal road. Once you get there, you can start by exploring either the southern or northern part of the peninsula and then loop around. There are few roads on the peninsula so the route is easy to follow once you get there. If you start in the north, it is about a 2 hour and 10 minute drive to Stykkishólmur which is the largest town on the peninsula, and then you can head west along the northern part of the peninsula stopping at your choice of places of interest. Some of the highlights include the town of Stykkishólmur, Bjarnarhöfn Shark Museum, Snæfellsjökull National Park, the beautiful Kirkjufell mountain and waterfall, the coastal area between the villages of Arnarstapi and Hellnar, Djúpalónssandur’s black-pebbled beach, and the cute wooden church known as Búðakirkja. Glacier treks, snowmobiling trips, and cave tours are popular activities that can be booked at Snæfellsjökull from local companies (book any activities in advance). 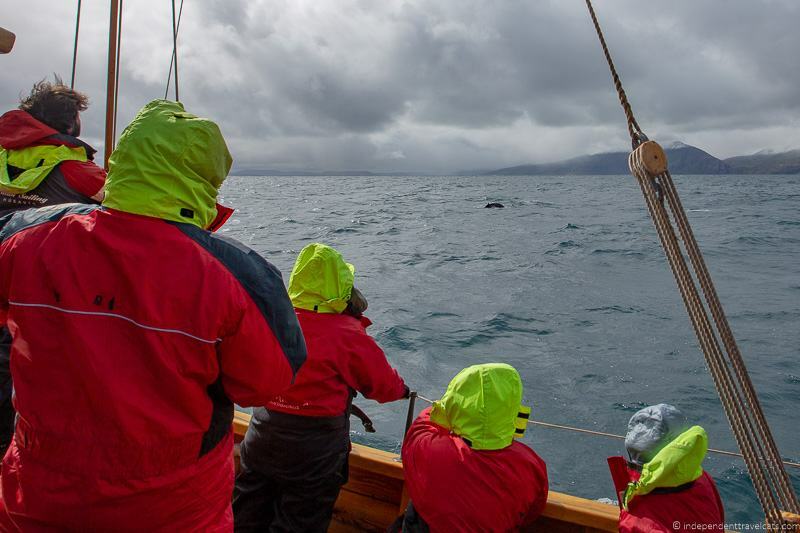 You can also book a winter whale watching tour here that leaves from Grundarfjordur. If you driving this as a day trip and wanted to see all the main highlights, it would be at least a 7 hour road trip round-trip from Reykjavík. However, with stops, I’d recommend at least 9 to 10 hours. Given the limited daylight hours in winter, you’ll want to leave in the morning and you won’t be back in Reykjavík until after dark. Although this makes a great full day tip, if you have your own car and time, we’d recommend doing it as an overnight trip so you don’t have to rush. The peninsula is also a great place to see the Northern Lights. If you do decide to overnight on the Snæfellsnes Peninsula, some lodging options to consider: Fosshotel Stykkishólmur (Stykkishólmur), Our Home Apartments (Stykkishólmur), Hotel Egilsen (Stykkishólmur), Old Post Office Guest House (Grundarfjordur), Fosshotel Hellnar (Hellnar), Arnarstapi Guesthouse (near Arnarstapi), Guesthouse Hof (near Budir), and Hotel Budir (Budir). If you’d rather join a tour and not have to worry about the driving, there are two winter options for this tour that we’d suggest. 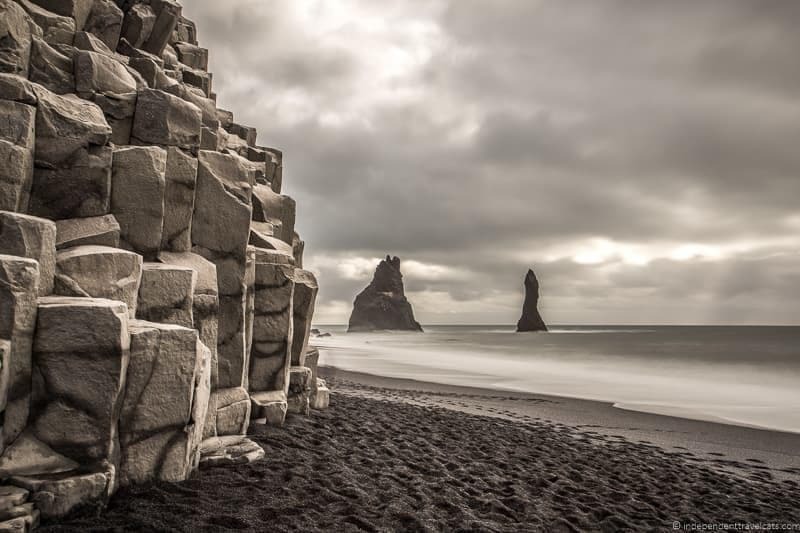 These are the Wonders of Snaefellsnes tour, and the slightly shorter Premium Snaefellsnes Peninsula small group tour. These offer slightly different experiences and price points, so check them both out to be sure you pick the right tour for you. Both include stops at the main highlights on the peninsula. For most of the winter in Iceland, you can pretty much be guaranteed that you’ll find snow somewhere in Iceland. Snow generally starts falling around November and can last as long as late May or early June, but late December to the end of March are going to be the prime time to visit for snow activities. In addition to skiing and snowboarding (already covered above), you’ll find opportunities to go ice skating, snowmobiling, sledding, ice climbing, snowshoeing, dogsledding, and ice fishing. Or if those options sound exhausting (or too expensive), you can just head outside and build some snowmen or make snow angels. It is easy to stop off for some fun in the snow if you are traveling in Iceland during the winter. The highland mountain roads will be closed throughout the winter to regular vehicles (including 4X4s) but many of these areas can still be explored on guided tours with snowmobiles, snowcats, or SuperJeeps. If you are coming to Iceland primarily for winter sports or snow activities, I’d recommend checking out offered multi-day treks or highly active winter trips with professional local guides that include activities like long-distance snowshoeing, snowmobiling, ice climbing, hikes on glaciers, and skiing. However, if you are just looking to try out a winter activity or two on your trip, I’d just book a couple of tours to add onto your Iceland winter road trip. If you need to rent winter gear while in Iceland (e.g., camping and climbing gear, ice axes, crampons, avalanche safety gear, emergency kits), I’d check out Everest in Reykjavík. If you book a tour, most companies will outfit you with the necessary equipment, but I’d advise bringing along a good pair of waterproof hiking boots, warm layers, gloves, a hat, a waterproof jacket, and waterproof pants if you plan to spend much time in the snow. I would definitely buy and bring along any winter clothing you are going to need on your trip as buying winter clothing in Iceland can be very expensive. Note that if you are looking for a sled or sledge to go sledding then you will struggle to find one as it is not a popular activity in Iceland and there are no groomed tracks for tobogganing. So you may want to make your own sled (e.g., buy a plastic trash can lid) and find some snow-covered hills to enjoy. But if you want a real sledding experience, I’d book a Snowcat mountain tour with Kaldbaksferðir (located in northern Iceland near Akureyri) and then go sledding down the mountain with one of their own tough-built sleds that were designed to endure the ride down the mountain. For those looking to go ice skating, there is normally an outdoor public ice skating ring in Reykjavík over the holidays. There are also indoor ice skating rinks such as the Reykjavík Skating Hall and Egilshöllin in Reykjavík and The Skate Club in Akureyri. Ice climbers may want to head to Skaftafell, Sólheimajökull, or the icefalls in Kaldakinn, and can join ice climbing tours such as this one or these ones. You’ll find plenty of snowmobiling and snowshoeing opportunities near glaciers and at higher elevations where there is more snow. For snowshoeing, you can go on your own or join a snowshoe day trip such as this introductory one near Snæfellsjökull National Park and several snowshoe day trips offered by Wide Open. There are variety of snowmobiling trips available, such as this one on the Myrdalsjökull glacier in southern Iceland and this one on Langjökull Glacier. For more unusual winter experiences, you can join a dog sledding tour, or go ice fishing on Lake Langavatn. Depending on what you are interested in, there are still a lot of winter activities you can do by day tripping from Reykjavík. First, ice skating can be done in the city itself at one of the indoor rinks or at the public outdoor rink that is often open in the winter. 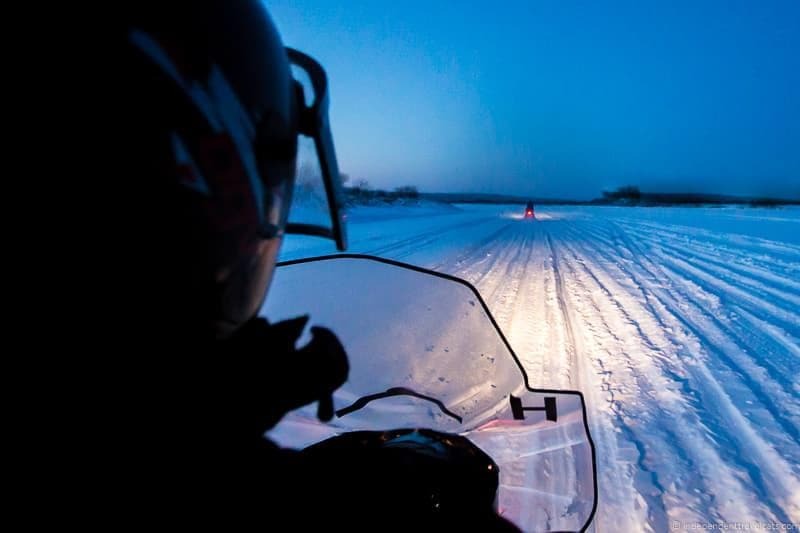 For snowmobiling, there are a lot of tours, but since the best snowmobiling opportunities are 2 to 4 hours away, I’d recommend doing this as part of a longer day trip to make the most of your time. For example, you can go snowmobiling in addition to a Golden Circle SuperJeep tour or combine a snowmobile tour with a thermal bath visit. 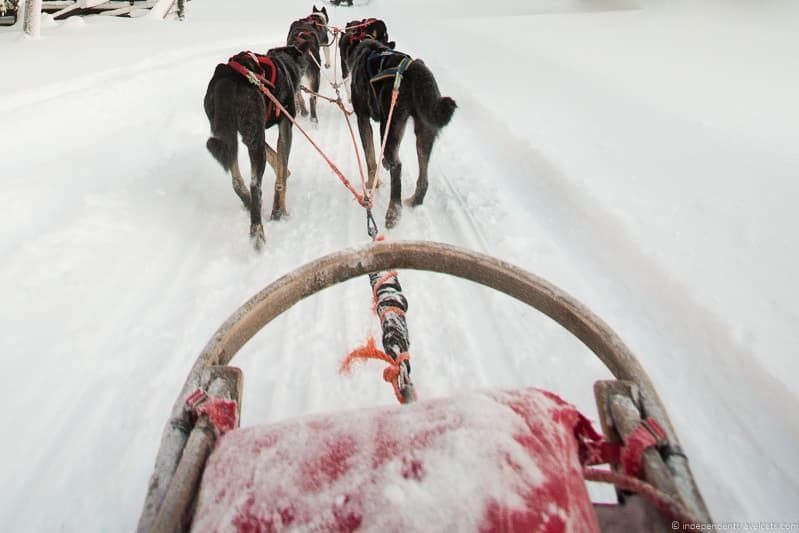 Other snow activities that you can join from Reykjavík include this ice climbing tour and this dog sledding tour. Iceland is a great country to go hiking, and it has a number of very popular hiking trails. The issue is that the majority of the most popular trails are located in the Highlands and are inaccessible in winter due to snow and ice. However, there are a number of scenic Lowland trails for those wanting to get a taste of hiking in Iceland! Winter hiking opportunities can be found throughout the country, and include inland trails, coastal trails, and even a number of smaller mountains. Obviously you need to be prepared for all kinds of winter weather, which can include rain, snow, and hail. Never underestimate the Icelandic weather as it can change rapidly, and it has gotten the better of many hikers. Bring warm layers, waterproof outer layers, good waterproof hiking boots, hat and gloves, and a waterproof hiking bag. If you plan to do longer hikes, you’ll also want to get needed navigational gear (e.g., compass, maps), winter weather gear (e.g., crampons, ice axe), safety gear (e.g., rent an emergency beacon), and medical emergency supplies (e.g., first aid kit, emergency blanket). For hiking and climbing gear, check out outdoor and camping supply stores such as Everest in Reykjavík. Before attempting any hike on your own, be sure to learn as much about the hike and trail conditions so you are prepared. Also, be sure to check for weather and safety alerts on the Iceland SafeTravel website, which is run by the Icelandic Association for Search and Rescue. If you plan to go out hiking on your own, you can input your travel plan, contact information, and medical info on the website. You can also rent an emergency beacon at several locations in Iceland so that local search & rescue teams can located you quickly if necessary. If you are just looking for some nature hikes near (or even in) the capital (you can even find many trees! ), I’d check out the Heiðmörk nature reserve, Elliðaárdalur, and for an easy central hill hike Öskjuhlíð. 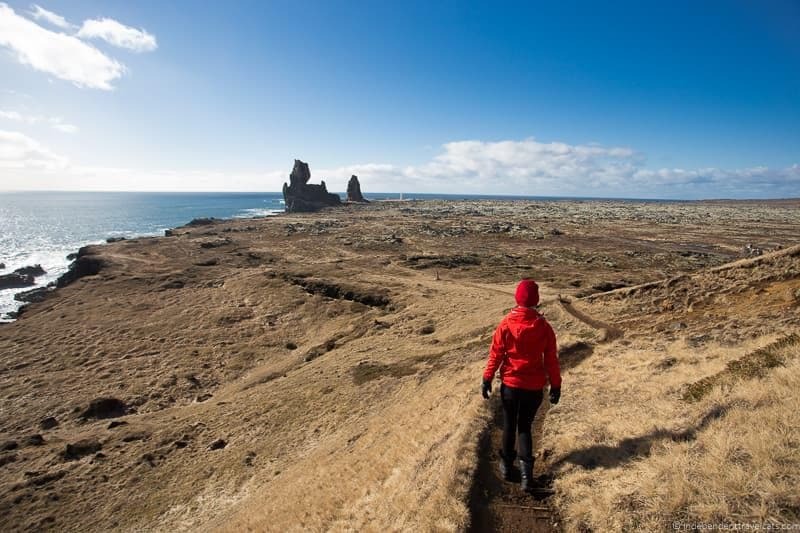 If you are looking for something a bit more challenging, consider some of the smaller mountains near Reykjavík, most of which take between two and six hours to hike up and down. These include Mt. Mosfell, Mt. Helgafell, Mt. Keilir, and Mt. Úlfarsfell. Mt. Esjan can also be a possibility if the weather conditions are good (not recommended to go past the Steinn as can be difficult and slippery even in summer!). Note that public buses can take you near the trailheads for many of these hikes. 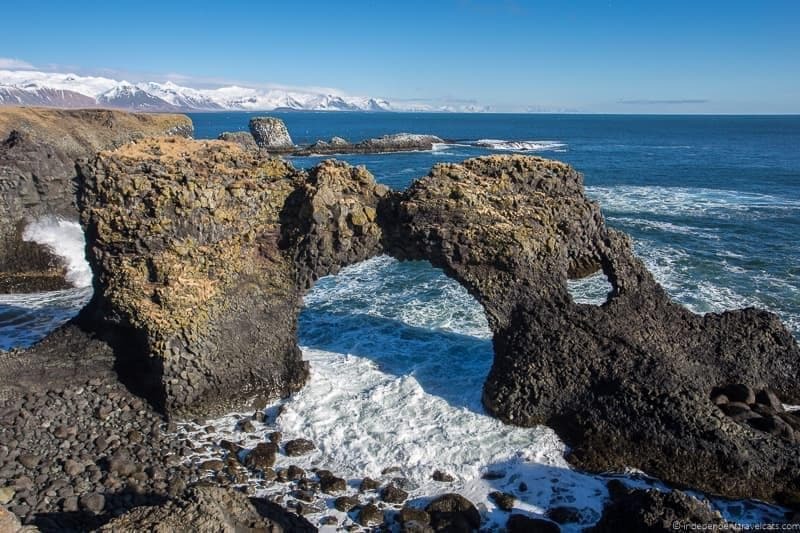 There are also some lovely coastal, lava field, and hill hikes on the Snæfellsnes Peninsula that are safe to do year round in good weather conditions. 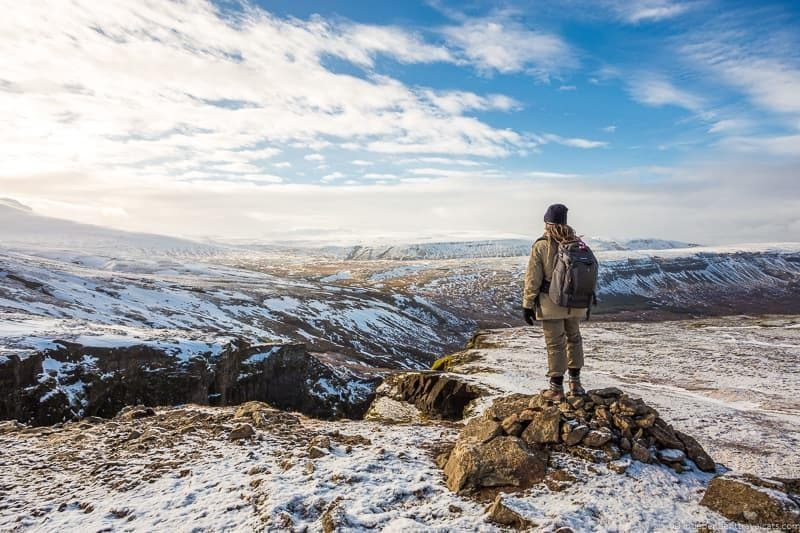 Obviously there are hundreds of other winter hikes in Iceland you could do depending on which part of Iceland you are in, and I’d just consult with local people and check weather conditions for good and safe hikes as you travel. The safety and feasibility of most hiking trails is going to depend entirely on the weather. If you are looking for more long-distance winter hiking, technical climbing, or mountaineering, I’d highly advise joining a tour or hiring a private local guide. They know where the best places to go are, the gear that is necessary, and what is and is not safe to attempt. I’d check out offerings from companies like Mountain Guides and Summit Guides, and if you don’t see what you are looking for, I’d contact them and see if they can help or recommend a local guide. Connect with local hikers and hiking groups and they can let you know what places they’d recommend (and which they recommend avoiding) in the winter. As noted above, there are actually a lot of easy to medium difficulty hikes located near Reykjavík which include local nature and recreation areas as well as smaller mountains. Most of these can actually be reached by taking the public bus or you could take a taxi to the trailhead. If you are planning on one of the mountains, just be sure to check weather conditions and trail information before setting out. For those looking for a day trip, you could take a tour like this one that includes a hike along the scenic trail into Reykjadalur and a hot spring stop or this one that includes a hike in the Thórsmörk (Þórsmörk) Natural Reserve. For those who are more fit, you can also join a private tour to summit Snæfellsjökull with Summit Guides. If you are not visiting during Christmas or New Years, you can still catch some of the other fun winter holidays and festivals in Finland. For example there is Þorrablót (Thorrablot) which is a mid-winter Icelandic festival which includes ancient Norse traditions and feasting on traditional Icelandic foods. There is also the Winter Lights Festival in Reykjavík each winter that focuses on celebrating the increasing sun light (after a few months of darkness) and Icelandic culture. Before Lent, there are a number of food-related holidays such as Bolludagur (Bun Day) where it is common to eat cream buns or Sprengidagur (Shrove Tuesday) where it is traditional to eat a big meal with lots of salted meat (lamb being the popular choice). Other fun winter festivals in Iceland include the Reykjavík Food & Fun Festival, Design March, and the Annual Icelandic Beer Festival. You won’t find many tours for these, as the festivals are probably best enjoyed on your own. The best place to enjoy most of these festivals is in Reykjavík, and they can easily be explored on foot, by car, or by local public transportation. Check the festival website or local papers for the events happening during your visit. If you are excited to try out local foods, you definitely need to get yourself on a food tour while you’re in Iceland! Icelandic food is not all about hákarl (fermented shark, a national dish) and there are also delicious seafood and lamb dishes, flat breads, geothermally grown vegetables, and much more to try. Also check the dates for the annual Food and Fun festival, which is the country’s largest food festival that takes place each winter in Reykjavík. In terms of food, Iceland is known for a lot of things from shark and lamb to langoustine and salt to fresh berries and skyr. 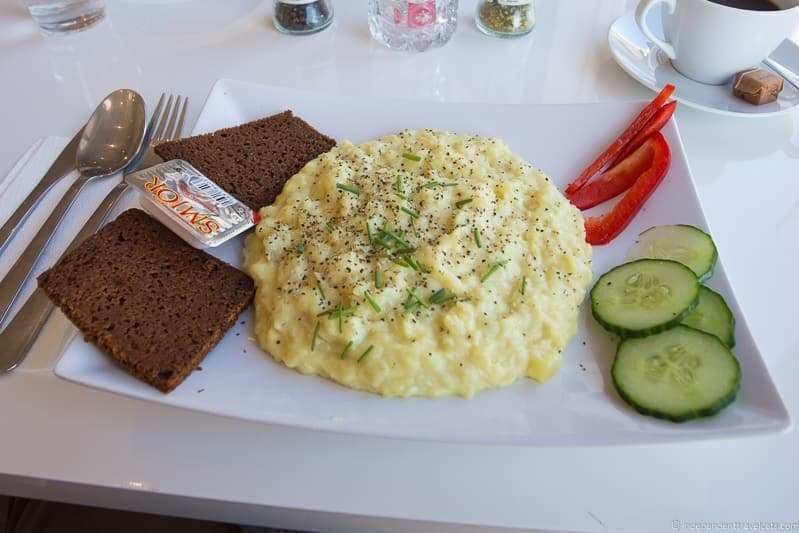 There are so many things you might want to include on a self-drive food tour such as hot dogs in Reykjavík, vegetables grown at one of the countries geothermal greenhouses (some have attached cafés or restaurants), langoustine soup in Stokkseyri, hákarl at the Shark Museum, fresh skyr or ice cream from Efstidalur II, rye bread from a geothermal bakery at Fontana, and plokkfiskur (a mashed fish soup) which is a traditional staple that can be found at restaurants around the country. You can also purchase a lot of local food products to take home such as sea salt, berry jams, meat jerky, and herbal teas. 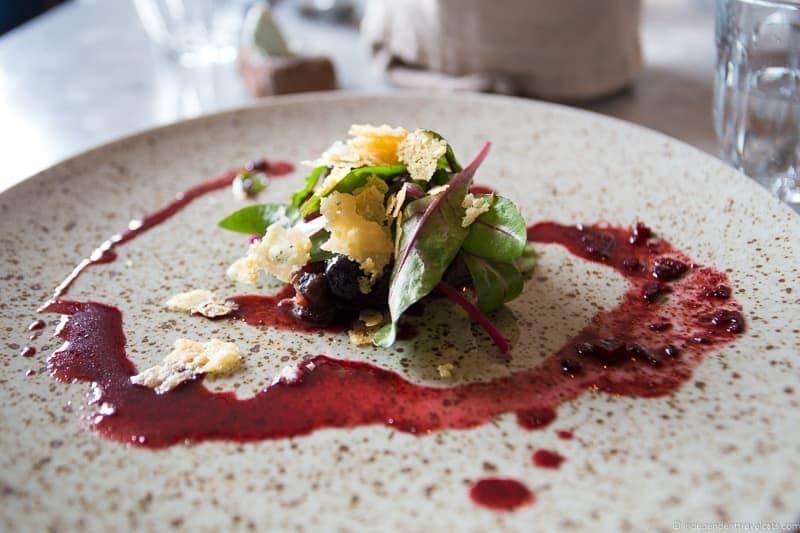 To get a sense of the wide range of food from traditional home cooking to the latest innovative dishes, you’ll want to stop at some of the farm to table restaurants that dot the countryside as well as the more refined restaurants of Reykjavík. Note that several restaurants in Reykjavík offer a traditional Icelandic food menu if you are looking for more adventurous Iceland food items (e.g., fermented shark, sheep’s head, whale, horse). If you are in Reykjavík, you can read some reviews online and put together your own walking tour of some of the best sounding food stops in the city. That way you can burn off some calories in between stops! If you are looking for a guided food tour, one excellent option is the Golden Circle food tour, which includes the classic Golden Circle day tour stops plus visits to a local farm, meals, and lots of tastings of local products throughout the day. In Reykjavik, you might want to try this food walking tour to try some of the cities specialities. If you’d prefer to learn the art of Icelandic cooking, you can also take a cooking class in Reykjavík. This includes a hands on cooking experience, followed by a three-course meal. It’s not all food either. Iceland has a burgeoning craft beer scene, and you can pair food and beer together on the excellent Cheers to Reykjavík tour, which includes at least six different beers paired with traditional Icelandic cuisine. plokkfiskur – an Icelandic traditional comfort food staple! Looking for a fun way to enjoy the mountains during the winter without having to hike, ski, or don snowshoes? Consider heading out on an ATV, a mountain buggy, or even getting a great view of the mountains from above in a helicopter. I don’t know of any places renting quad bikes or mountain buggies in Iceland, so you’ll probably need to join a tour if you want to do one of these activities. 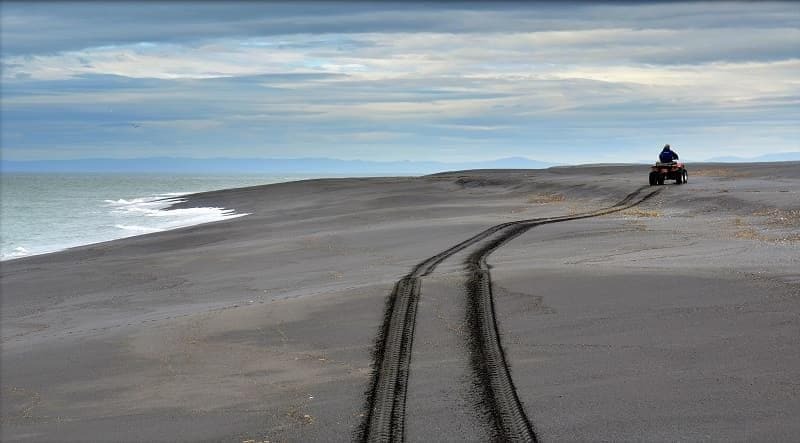 Several companies offer ATV rides, and for example you can take a mountain Buggy Adventure from Mosfellsbaer or a scenic quad biking tour from Reykjavík. Or if you’d rather see Iceland from above, you can do a helicopter tour that flies over Iceland’s mountains, glaciers, waterfalls, and South Coast! There is nothing quite like slipping into one of Iceland’s geothermally heated hot springs or swimming pools in the cold winter months! Most hot springs and public pools in Iceland are open year round, so it is easy to add a hot spring to your itinerary. These range from the world famous Blue Lagoon to the local public baths to lesser known springs away from Reykjavík. Treating yourself to at least one is a must when visiting Iceland in winter! Many people want to go to the Blue Lagoon, which given its popularity, we totally understand and it about a 23 minute car ride from Keflavik airport or a 45 minute drive from downtown Reykjavík. If you want to go to the Blue Lagoon, you must pre-book a timed appointment. 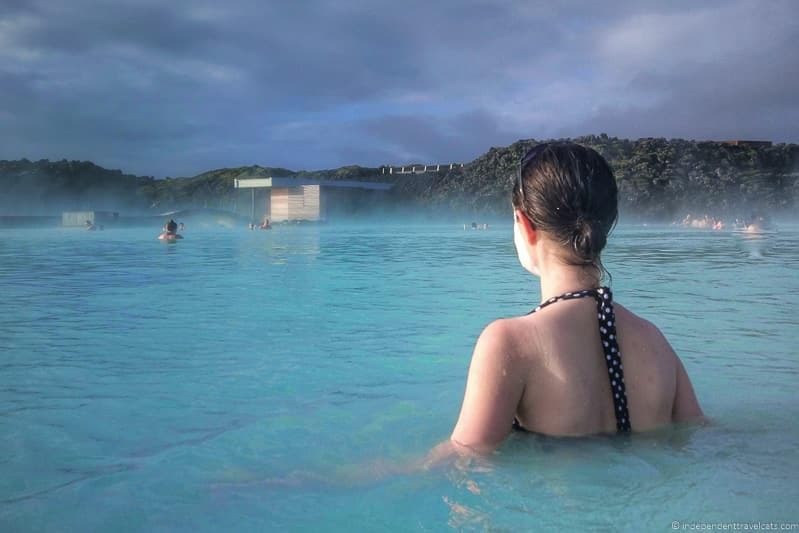 If you are looking for a nice alternative to the Blue Lagoon we’d recommend checking out spots like the Secret Lagoon or Myvatn Nature baths. Both are popular and scenic but less crowded and less expensive than the Blue Lagoon. 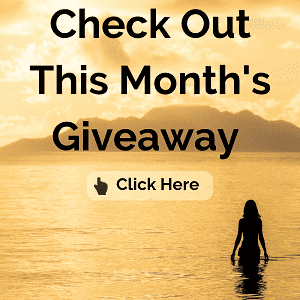 Of course there are hundreds of geothermal hot springs, swimming pools, and spas in Iceland and here is a good list if you are wanting to visit a number of them on a road trip. If you are looking for a local experience, I’d join locals at one of the public swimming pools, which generally include a geothermally heated large lap pool, hot tubs of varying temperatures, and a kiddie pool. You’ll find over a dozen of these in Reykjavík alone, plus one in about every Icelandic town of any size. Most popular with locals before and after typical work hours, we found our visits very relaxed in the afternoon. If you are planning to hit the lesser known spots and pubic pools, you’ll want to bring your own towel and any gear as these will not be provided and may not be available to rent or buy on site. Note that you should never just jump into an unknown hot spring or pool you come across while hiking as some are hot enough to boil an egg, and the water temperature can change rapidly in some spots! The Blue Lagoon can be booked as an easy day trip from Reykjavík with regular bus and shuttle departures from the airport and downtown. Some tours may include the entrance fee, while others just include the bus transfer. You can book your Blue Lagoon time slot online here (must have a pre-booked time to visit) and then book a corresponding transfer. Both the spa itself (just book as an optional add-on when booking your time slot) as well as numerous travel and bus companies offer transfers such as here and here. You can also book day tours from Reykjavík that include a stop at a thermal bath or swimming pool along with a day of other activities. For the Blue Lagoon, we recommend checking out this list of tours that include a number of day trips to the Blue Lagoon, such as this day tour that includes stops at the main Golden Circle sites, Kerid Crater, and the Blue Lagoon. If you are looking for a less busy alternative to the Blue Lagoon, there are many tours from Reykjavík that include alternative hot springs as well. 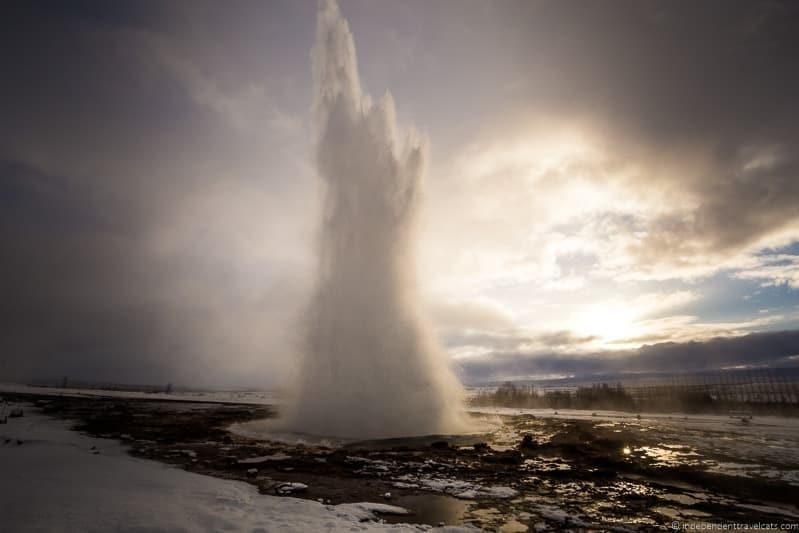 For example, geothermal bath stops can be combined with Golden Circle tours (such as this tour), a Super Jeep tour of the southern highlands, a lava cave tour, and while searching for the Northern Lights. This jam-packed full day tour includes the classic Golden Circle Tour, a stop at a geothermal pool, local Icelandic food stops, and a chance to see the Northern Lights! So there are our favorite things to do in Iceland in winter! As you can see, there’s plenty to do in Iceland in winter, so don’t let the shorter days and colder weather put you off. For more information and advice on planning your trip to Iceland we’d recommend checking out our Iceland trip planning tips, our recommended 7 day winter Iceland itinerary, our guide to 3 days in Iceland, our Iceland winter driving tips, our winter Iceland packing list, and photography highlights guide. Iceland can be an expensive destination and we recommend checking out our tips for traveling to Iceland on a budget. Have you visited Iceland in winter, or would you like to? Which of these winter activities would you like to do? Let us know in the comments below! I wasn’t quite brave enough to visit Iceland in winter, but it looks like a spectacular place no matter what season. I love all your ideas of what to do when winter hits! Snowmobiling across Iceland’s landscape would be truly incredible. I live in Iceland! You note so many of the wonderful thing to do here in winter, but not just a good place in winter. Reykjavik and Iceland are filled with lots of things to do such as museums like the beautiful attractions like great outdoors, day trips, Midnight Sun and the Northern Lights, eco tourism, volcanoes, mountains, lakes, glaciers, rivers, caves, black beaches and so much more. Nice and informative article on things to do in winter in Iceland. So many activities! Thanks for sharing it. We visited Iceland a few years ago for our first time in the winter. I thought it was going to be impossible to get around to all the awesome things, but it wasn’t. We did come across a blizzard or two and a few road closures, but it didn’t stop us from having a fantastic time. Iceland has been on my bucket list for a long time, but I had always thought that I should visit it in summer. However, after reading this I am considering visiting during winter. I think celebrating Christmas and New Years there would be so magical. I would love to take one of the Golden Circle Tours that you mentioned and to visit the ice caves. Whale watching would also be an incredible experience. I see you tasted the fermented shark – what was it like? Wow, this was a really helpful and comprehensive post! I had no idea skiing was a thing in Iceland and I definitely didn’t know snorkeling was! I am going to Sweden in search of the Northern Lights in a couple weeks and I am going to use some of your Iceland tips! I think they will translate well! Thanks! Ice tunnels, ice caves and glaciers look lovely, but you do look like you need many layers of clothing to visit them. 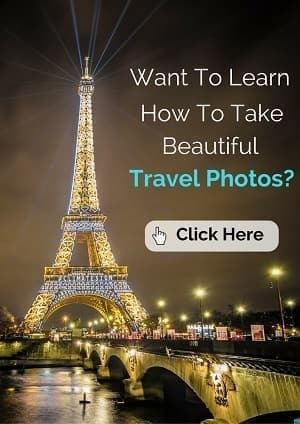 Your photos are just amazing and I admit to being very tempted by the sights, the food and the experiences you outline in this post. It looks as if it is a truly unique place – no wonder it’s one of the most popular destinations at the moment. It’s so funny, these two horses, the one with the white mane and grey fur and the fox red one, look like my horses. It’s a dream of mine to visit Iceland in winter time and of course, at least with a day tour on Icelandic horses. I’d love to see the Northern Light, too. It must be like a fairytale come true! I went to Iceland several years ago at the beginning of March and the end of their winter and absolutely loved it. I went hiking (via car rental) throughout the entire southern part. The only thing I wish I had done was those cave tubes you guys did. How amazing was that? I loved all the waterfalls, rock formations, and several geothermal pools that are out there. I think if I get a chance to return, I would love to go back in Summer to see it not blanketed in white to see all the beautiful colors hidden beneath the snow! Hi Edoardo, Glad you found our Iceland winter activities post helpful! You might also like our 7 day Iceland itinerary and our Iceland planning posts! Let us know if you have any questions as you plan your own trip to Iceland. Wishing you a wonderful New Year as well! Iceland has been on my winter bucket list for a while now, I hope I take a trip here next year :D. I would wholly watch the northern lights 🙂 and I have heard so much about the Ice Caves! So many great things to do in Iceland in winter time! I spent 1 night in Reykjavik this summer on a layover, and my next trip will definitely be a winter trip! I only had time for a food tour and the Blue Lagoon, but there is obviously so much to see, and the Northern Lights are a big draw for me! Hi Medha, Glad the article was helpful! Yes, like most destinations with seasonal weather, there are going to be trade-offs and different experiences available no matter when you visit. I think most people visit during the summer on a first trip and then maybe come back for winter. We are planning to do it the other way around. But no matter when you go, you can still see many of the main spots in Iceland, although in winter we recommend focusing on the west and south (the area most people visit on a first trip to Iceland any time of the year). In October, which is autumn, you’ll probably be there too early for some of the winter activities that require a lot of snow like skiing, snowshoeing, & dog sledding but you’ll be able to explore ice caves & ice tunnels, go ice skating, and go snowmobiling during that time of year. Northern Lights can certainly be seen in October (I’d recommend later in October for more dark hours) but it always just depends on the solar activity and weather! During the autumn months, Iceland has its annual international film festival and indie music festival if either of those are of interest. No matter when you visit, I am sure you’ll have fun and best of luck on seeing the Northern Lights! I have to admit I am not much of a cold weather person, but those ice tunnels are pretty cool. I don’t think you could talk me into snorkeling, even with a dry suit, but I would love seeing those horses and the thermal baths. I’m sure the geysers are also amazing, as I loved being in Yellowstone and watching them. Reindeer trekking also sounds fun. I’ve never thought about going to Iceland before, but maybe… it looks more fun in these photos than I would have imagined!